BOULDER, Colo. (AP) Dominique Collier never quite lived up to the hype at the University of Colorado – until Sunday in his final game at the Coors Events Center. Big things were expected of the talented guard after he scored 18 points in leading Denver East High School to the state championship at this very arena in 2014. But he had never even matched that output in four seasons on the familiar hardwood. ”We’ve had a lot of good, big wins in this building,” Collier said after celebrating Senior Day with a season-high 19 points, leading Colorado past UCLA 80-76 for its first-ever season sweep of the Bruins. Behind Collier’s 14 first-half points, Colorado (16-13, 8-9 Pac-12) took a nine-point lead into the locker room at halftime but came out cold in the second half. The Buffs missed 14 of 18 shots and watched the Bruins (19-10, 10-7) roar back behind Aaron Holiday (21 points) and Kris Wilkes, who finished with 20 points. In addition to Collier, the seniors were George King, who scored 16, Tory Miller-Stewart, who broke a foot earlier this season, and Josh Repine, who received a big ovation when he entered the game with 3.4 seconds left and ended up with the ball in his hands at the buzzer. UCLA: The Bruins failed to join USC and Arizona in the 20-win club and were swept by Colorado for the first time since the Buffaloes joined the Pac-12 in 2011. After winning six of their previous seven, the Bruins went 0-2 on their Utah-Colorado swing. 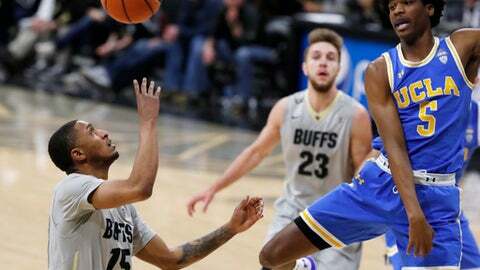 Colorado: The Buffaloes’ only conference win on the road came against UCLA at Pauley Pavilion on Jan. 13, when they won 68-59. They’re now 4-11 against the Bruins, but 3-3 at home. UCLA: The Bruins visit archrival USC next Saturday night. UCLA edged the Trojans 82-79 in a thriller on Feb. 2. Colorado: The Buffs wrap up the regular season at Utah on Saturday. Colorado beat the Utes 67-55 in Boulder.